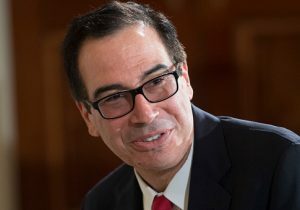 The Treasury Department plans to eliminate nearly 300 outdated tax regulations, getting tax rules off the books that in some cases have not applied since the 1940s. The department announced its proposal to eliminate unnecessary tax regulations this week, in compliance with two executive orders signed by President Donald Trump last year to reduce regulatory burdens and simplify the tax code. "We continue our work to ensure that our tax regulatory system promotes economic growth," said Secretary Steven Mnuchin. "These 298 regulations serve no useful purpose to taxpayers and we have proposed eliminating them." "I look forward to continuing to build on our efforts to make the regulatory system more efficient and effective," he said. Executive Order 13789, signed last April, instructs the Treasury to "bring clarity" to the tax code and identify all tax regulations that "impose an undue financial burden on United States taxpayers," "add undue complexity to the Federal tax laws," or "exceed the statutory authority of the Internal Revenue Service." The department's latest action addresses the complexity of the tax code. The proposed rule would remove tax regulations that have already been repealed; repeal regulations that have been significantly changed from their original purpose; and repeal regulations that are no longer applicable. "This notice of proposed rulemaking proposes to streamline IRS regulations by removing 298 regulations that are no longer necessary because they do not have any current or future applicability under the Internal Revenue Code and by amending 79 regulations to reflect the proposed removal of the 298 regulations," the department said in a rulemaking notice published Thursday. Included in the roughly 300 tax rules to be removed from the tax code are exemptions that were repealed more than seven decades ago in the Public Debt Act of 1941. The law raised the debt limit to $65 billion. The current debt ceiling sits at $20.5 trillion. A tax exemption for dividends from shares and stock that was repealed in 1942 would also be removed. Regulations from the Excise Tax Reduction Act of 1965, the Tax Reform Act of 1976, and the last substantial tax reform in 1986, would also be removed.